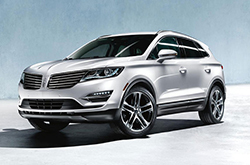 Sporting a sleek, athletic exterior and a finely appointed cabin, the Lincoln MKC has earned a solid reputation among luxury car shoppers in Grapevine. This model year, the 2016 Lincoln MKC is getting a new infotainment system, as well as a higher towing capacity that adds even more functionality to the popular SUV. To learn all about the many terrific features on this latest model of the MKC, keep reading our 2016 Lincoln MKC review below. The 2016 MKC is available in four trim levels: Premier, Select, Reserve and Black Label. Standard features on the MKC Premier model include 18-inch alloy wheels, heated mirrors, rear parking sensors, LED taillights, keyless ignition and entry, leatherette upholstery, heated front seats, a rearview camera, voice controls and the newly updated Sync 3 infotainment system. The SUV's Select trim adds leather upholstery, ambient interior lighting, a cargo cover, a newly added power liftgate and auto-dimming side mirrors. Many 2016 Lincoln MKC review were very impressed with both the Reserve and Black Label trims. The Reserve trim adds a liftgate with foot sensors, heated and ventilated front seats, MyLincoln mobile app integration, a navigation system and a power tilt-and-telescoping steering wheel. Finally, the Black Label trim offers a black grille, 19-inch wheels, upgraded leather upholstery, a roof rack, a 10-speaker sound system, four interior design options and access to Lincoln's Black Label program. Standard safety features on the 2016 Lincoln MKC in Grapevine include antilock disc brakes, stability control, a driver knee airbag, side curtain airbags and front-seat side airbags. The MyKey system is also standard, while the higher-up trims get upgraded tech, such as lane-departure warning and blind-spot monitoring. Under the hood, the 2016 MKC is powered by a 2.0-liter turbocharged four-cylinder engine that produces 240 horsepower and 270 lb.-ft. of torque. An optional 2.3-liter turbocharged four is also available that offers slightly more towing capacity and power output. If you're looking for a top-of-the-line luxury SUV near Dallas, stop by Grapevine Lincoln and test drive the 2016 Lincoln MKC available in Grapevine today! When you compare LINCOLN's new 2016 MKC next to the 2016 Cadillac SRX, Audi Q5 and the Buick Encore, we're sure you'll see that the MKC is the best match for you. 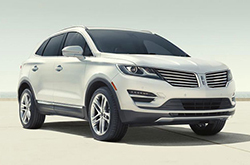 Shoppers will enjoy the MKC's inexpensive MSRP, as well as its eye-catching styling. Many drivers in Grapevine choose it because it's a truly amazing value; compare its price to the vehicles in its segment to see for yourself. View the MKC bullet list under this text for more quick facts. Welcome to the Grapevine Lincoln review of the new MKC. After reading our overview above, if you decide the MKC isn't the best vehicle for your needs, please check out other 2016 LINCOLN reviews in our research gallery. Good reviews are hard to find ; but as the chief LINCOLN dealer in Grapevine we've put it all in one location for you. 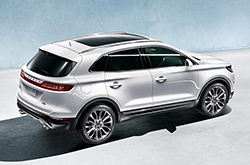 Filled with reliable information and specs, each summary gives you complete details about all the MKC has to offer Grapevine drivers in terms of powertrain options and much more. Learn more about our finely crafted portfolio of vehicles; visit the research library to review and compare other models offered by Grapevine Lincoln now!